The representative then said she would email Salgado phone numbers and contact information for food pantries and other public health programs in Chicago, Illinois, where Salgado was calling from. 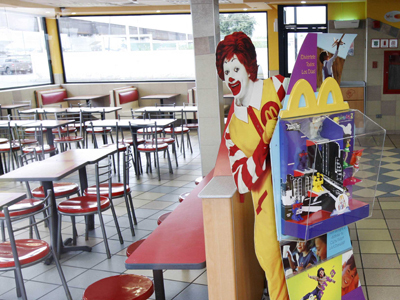 Perhaps even more shocking is that not all McDonald’s employees are guaranteed access to the would-be help line. 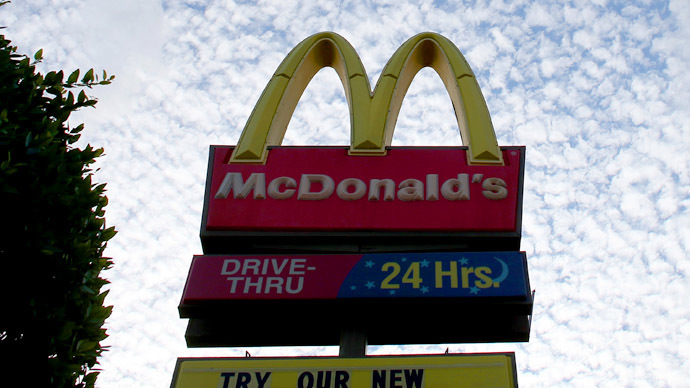 Franchise owners must pay a fee for their employees to use McResource and Salgado’s restaurant, for example, is among the many Chicago stores not afforded that privilege. Salgado, 26-year-old single mother who has said she is rarely allowed to work more than 30 hours a week, is the same woman who was arrested earlier this month. She interrupted McDonald’s Corporation President Jeff Stratton when he was speaking at the Union League Club of Chicago on October 11. She said at the time that she expected McDonald’s to retaliate in some way but was apparently not swayed from calling McResource. Salgado told the representative she was recording the call so her sister could listen later. 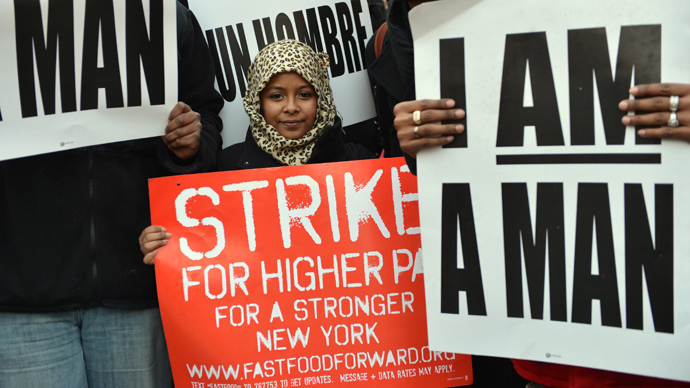 The publication of the call’s audio comes just days after a new report indicated that over half of fast-food works in the US rely on public assistance to supplement their paychecks, costing American taxpayers an estimated $7 billion every year. 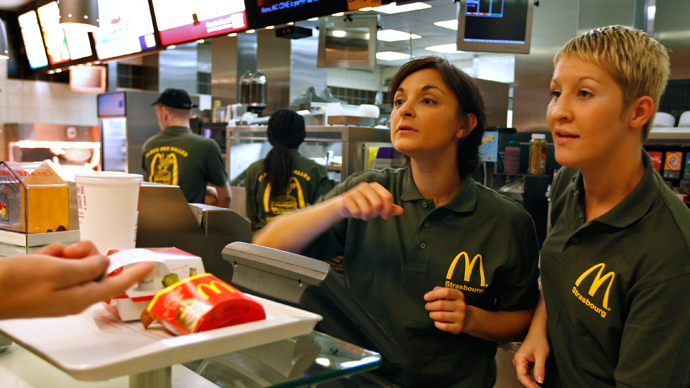 The average American fast food worker earns $8.69 an hour and regularly works less than 40 hours a week, qualifying them for a variety of government benefits. Fifty-two percent of families that include a fast food worker receive food stamps, Medicaid, or are eligible for the Earned Income Tax Credit and Temporary Assistance for Needy Families. Compare that sum with the 25 percent of families eligible for those assistance programs from the overall workforce. Researchers from the University of California at Berkeley and the University of Illinois at Urbana-Champaign determined that “non-managerial” employees – such as cashiers, cooks, servers, and others – are twice as likely to need financial help. 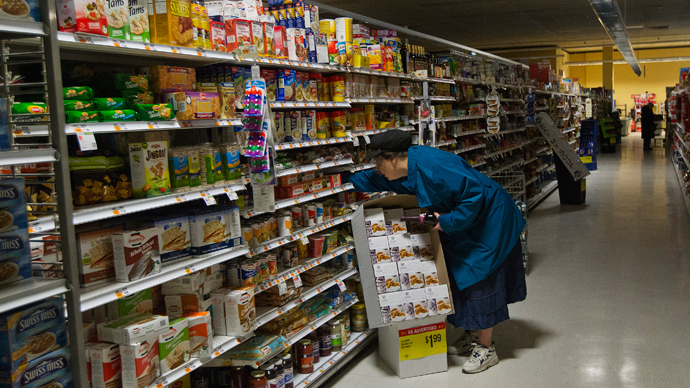 They deemed it “staggering” how government assistance programs effectively pay costs that major food chains refuse to.